In some cases, when installing Windows 10, 8.1, 7, when you select the disk to install the OS in Windows Setup, you may receive the error: Windows cannot be installed to this disk. The selected disk is of the GPT partition style. In this manual, we will look at what this error means and how to proceed with the installation of Windows when it appears. We have already talked about the MBR and GPT partition table styles, read this article first. The error “Windows cannot be installed to this disk. 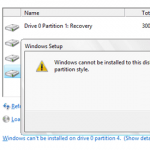 The selected disk is of the GPT partition style” means that the selected hard disk has a GPT partition table. You can continue installing Windows on a gpt drive only under several conditions. Otherwise, you will have to convert the partition table of your disk to the old MBR format. The computer is booted in the native UEFI mode. All modern computers support EFI. To enable EFI support, you need to restart the computer, access the UEFI menu (depending on the computer model, press the Esc, Delete, F1, F2, F10, F11 or F12 keys) and change the boot mode to UEFI. In various versions of UEFI, the name of this parameter may differ. For example, it may be called UEFI/BIOS Boot Mode. 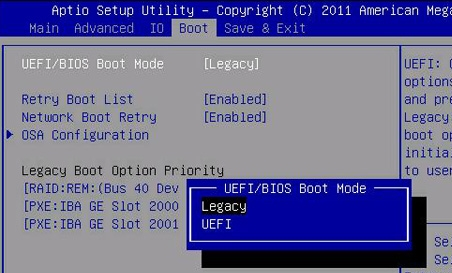 Change the parameter value from Legacy or CSM to UEFI. After changing the boot mode to UEFI, you can continue installing Windows 10 x64 on a GPT disk. If you used the Microsoft Media Creation Tool to create the bootable USB flash drive that used as a Windows installation source, check if you select the EFI boot mode in the Boot Menu boot menu on the BIOS Post Screen. If your computer is quite old and doesn’t support EFI (BIOS only), you will have to convert disk markup from GPT format to MBR. You will also need to convert the disk to MBR if you want to install Windows x86. 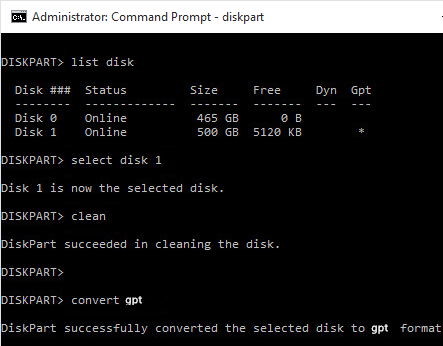 List the disks with the command list disk and find the number of your disk labeled GPT *. For example, you have determined that it is Disk 1. Close the command prompt and click “Refresh” in the Windows Setup window and try to continue the Windows installation.